The attorneys at Metaxas Brown Pidgeon have been handling the business litigation needs of emerging and established businesses, estates, and families on Boston's North Shore for over 30 years. The long-term relationships we've formed with many of our clients have been built on our commitment to consistently provide high-quality, personalized, and effective legal services. Our commitment to our clients ensures quick answers to important questions from senior attorneys. At Metaxas Brown Pidgeon, we understand that responsiveness is key to a successful client relationship. We strive to answer all phone or email messages as soon as possible, but no later than the next business day. Whenever an urgent matter arises, our clients are confident they'll have the legal advice they need to respond. 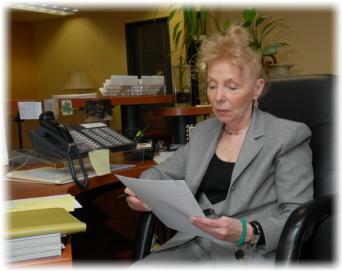 Our attorneys take the time to listen to our clients carefully to understand fully their needs and goals. Our approach helps ensure that we apply our extensive legal expertise and experience to achieving the best outcome possible for each client's particular situation. 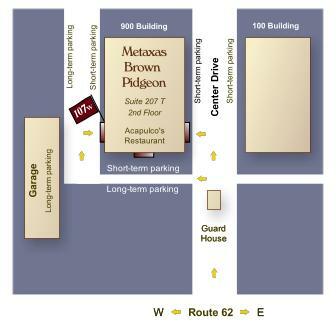 Metaxas Brown Pidgeon enjoys an extensive network of legal and business connections throughout the North Shore and Boston areas, as well as into selected international locales. It is our pleasure to provide our clients with referrals and introductions into this network whenever helpful. Take Route 1A North towards Beverly. After the Salem / Beverly Bridge, bear left at the fork to stay on Route 1A North toward Ipswich / Wenham. Follow Route 1A North for .9 miles to Route 62 / Elliott Street (Walgreens is on the right). Turn left onto Route 62 West / Elliott Street. Proceed to the Cummings Center on the right. Turn into the Cummings Center from Route 62 onto Center Drive. The 900 Cummings Center building is located to the left of Center Drive (the top right corner of the building is marked 900). After the guardhouse, turn left and then right. The entrance is directly across from the west parking garage walkway. 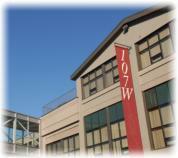 A Maroon flag labeled "107W" is over the entrance. We are on the second floor at the top of the stairs. This web site is not intended to constitute legal advice or the provision of legal services. By posting and/or maintaining this Web site and its contents, Metaxas Brown Pidgeon LLP does not intend to solicit legal business from clients located in states or jurisdictions where Metaxas Brown Pidgeon LLP or its individual attorneys are not licensed or authorized to practice law. The Law Offices of Christopher W. Parker, LLC are professionally associated with Metaxas Brown Pidgeon LLP. Under the rules established by the Supreme Judicial Court of Massachusetts, both The Law Offices of Christopher W. Parker, LLC and Metaxas Brown Pidgeon LLP are independent entities and are not responsible for the practice or the liability of any attorney in each other's law firm. Some links within this Web site may lead to other sites. Metaxas Brown Pidgeon LLP does not necessarily sponsor, endorse, or otherwise approve of the materials appearing in such sites. The materials on this web site have been prepared for informational purposes only and do not constitute legal advice and therefore should not be acted upon as legal advice. Any unsolicited information you submit via email will not be considered confidential and does not establish an attorney-client relationship. Copyright � 2011 Metaxas Brown Pidgeon LLP. All rights reserved. Attorney advertising. Prior results do not guarantee a similar outcome.